Samsung Foundry on Wednesday said that it had started production of chips using its 7LPP manufacturing technology that uses extreme ultraviolet lithography (EUVL) for select layers. The new fabrication process will enable Samsung to significantly increase transistor density of chips while optimizing their power consumption. Furthermore, usage of EUVL allows Samsung to reduce the number of masks it requires for each chip and shrink its production cycle. The maker of semiconductors says that 7LPP fabrication technology enables a 40% area reduction (at the same complexity) along with a 50% lower power consumption (at the same frequency and complexity) or a 20% higher performance (at the same power and complexity) when compared to 10LPE. 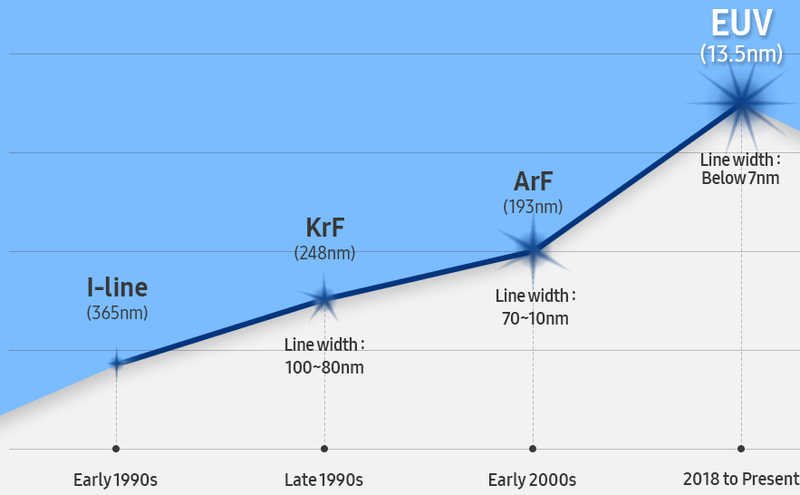 As it appears, usage of extreme ultraviolet lithography for select layers enables Samsung Foundry to place more transistors inside its next-gen SoCs and reduce their power consumption, a very compelling proposition for mobile SoCs that will be used inside future flagship smartphones. Samsung produces its 7LPP EUV chips at its Fab S3 in Hwaseong, South Korea. The company can process 1500 wafers a day on each of its ASML Twinscan NXE:3400B EUVL step and scan systems with a 280 W light source. Samsung does not say whether it uses pellicles that protect photomasks from degradation, but only indicates that usage of EUV enables it to cut the number of masks it requires for a chip by 20%. 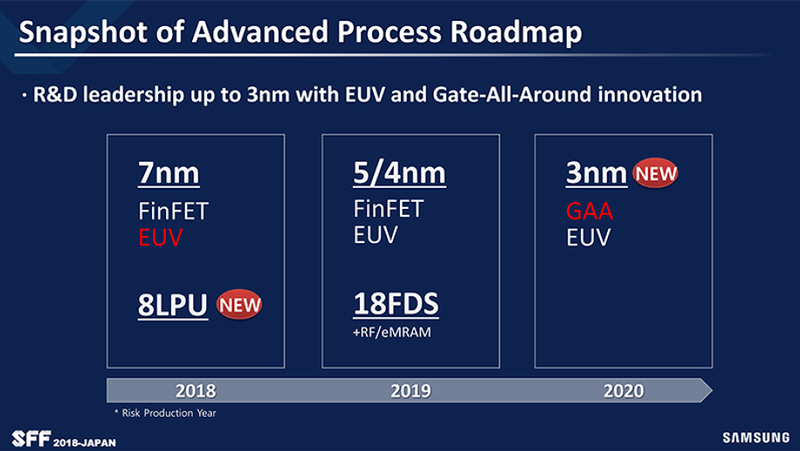 In addition, the company says that it had developed a proprietary EUV mask inspection tool to perform early defect detection and eliminate flaws early in the manufacturing cycle (which will likely have a positive effect on yields). Samsung Foundry does not disclose the name of its customers that that first to adopt its 7LPP manufacturing technology, but only implies that the first chips to use it will be aimed at mobile and HPC applications. Usually, Samsung Electronics is the first customer of the semiconductor unit to adopt its leading-edge fabrication processes. Therefore, expect a 7nm SoC inside Samsung’s high-end smartphones due in 2019. Furthermore, Qualcomm will use Samsung’s 7LPP tech for its “Snapdragon 5G mobile chipsets”. Samsung’s 7LPP manufacturing technology offers impressive advantages over the company’s 10LPE specifically for mobile SoCs. Meanwhile, in a bid to make the process attractive to a broad range of potential customers, the foundry offers a comprehensive set of design-enablement tools, interface IP (controllers and PHY), reference flows, and advanced packaging solutions. The final PDK is months away, but many customers may start development of their 7LPP SoCs even with existing set of solutions. At this point 7LPP is supported by numerous Samsung Advanced Foundry Ecosystem (SAFE) partners, including Ansys, Arm, Cadence, Mentor, SEMCO, Synopsys, and VeriSilicon. Among other things, Samsung and the said companies offer such interface IP solutions HBM2/2E, GDDR6, DDR5, USB 3.1, PCIe 5.0, and 112G SerDes. Therefore, developers of chips of SoCs due in 2021 and onwards, which will rely on PCIe Gen 5 and DDR5, can start designing their chips right now. As for packaging, chips made using 7LPP EUV technology can be coupled with 2.5D silicon interposer (if HBM2/2E memory is used) as well as Samsung’s embedded passive substrates. The launch of commercial production of chips using extreme ultraviolet lithography is a culmination of work by the whole semiconductor industry that began in 1985. 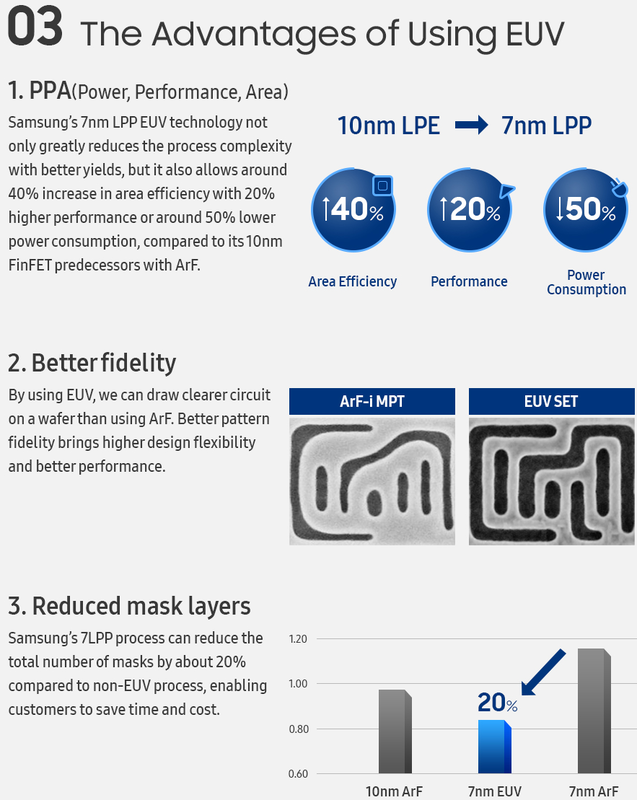 Ultimately, EUVL is expected to reduce usage of multi-patterning when producing complex elements of a chip and therefore simplify design process, improve yields, and shrink cycle times (or rather not make them longer in the foreseeable future). Meanwhile, it was extremely challenging to bring EUV from drawing boards to actual fabs because the technology is extremely complex. It needs all-new step-and-scan systems outfitted with all-new light source, new chemicals, new mask infrastructure, and numerous other components that took years to develop. 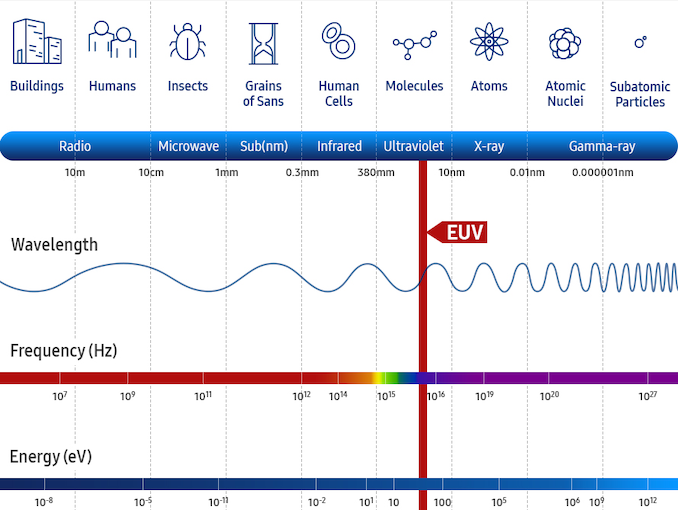 To learn more about EUV lithography, please check our article from 2016. Are you sure "pretty well" ? Your statement is vague. What is "pretty well" ? A bunch of wafers at 50% yields (no pellicles at all because not available not even in upcoming years) done only because Samsung "need" to manufacture the next phone SOC instead of Apple will destroy the high end market? If true your definition of "pretty well" do not fit to Intel or GloFo business structure.